Pow is a daemon that runs your rack (Rails) apps in the background when you request them at a special example_app.dev domain. You don’t have to start your app manually anymore (e.g. rails s). If you don’t use your app for 15 minutes it kills your app’s process to free up memory (restarting it on the next request). It doesn’t run workers (I recommend inline que workers via ActiveJob) or other daemons such as those in your Procfile. It just looks for a config.ru and (presumably) does a rackup on it. It’s very simple to set up and it’s Mac OS X only. Before running the install script, configure pow to use port 3300 rather than 80; this makes port forwarding easier and avoids unnecessary sudoing. You may prefer to skip this step or choose another port besides 3300. 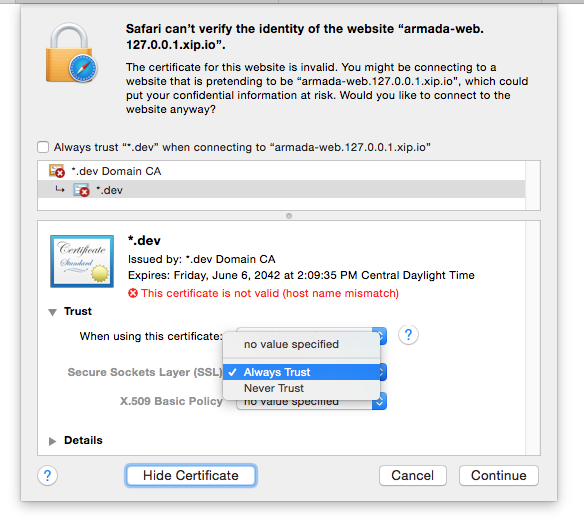 Trust the “unverified” self-signed certificate when prompted (should require admin password). Screenshot for Safari. In your shell, run open ~/.tunnelss. Send cert.pem to yourself (email/iMessage). Open the attachment on your iOS device and install the certificate (should require your pass code and warn you about it not be a verified certificate). To access your application, use xip.io. On your mac run ipconfig getifaddr en0 to get your local IP to use in the xip.io URL (e.g. https://example_app.10.0.1.4.xip.io:4430). Note: If you’re testing remotely you will need an SSH or VPN tunnel. As usual, Rails handles much of the code reloading for you so you won’t have to do this with every request. Just the typical reasons you’d need to restart the server for (modifying initializers, adding gems, modifying load paths, etc). Since pry isn’t connected to a tty, you won’t be able to start a debugger from your code the normal way (binding.pry). pry-remote has our back. Use binding.remote_pry in your code and then run pry-remote. This will attach your terminal to the pry debugging session. For memory efficiency, pow will shut down applications that are not used for some time (default is 15 minutes). Your application will take a few extra seconds to load the first time you come back to it.